I’ve got another quick weeknight dinner option for you! 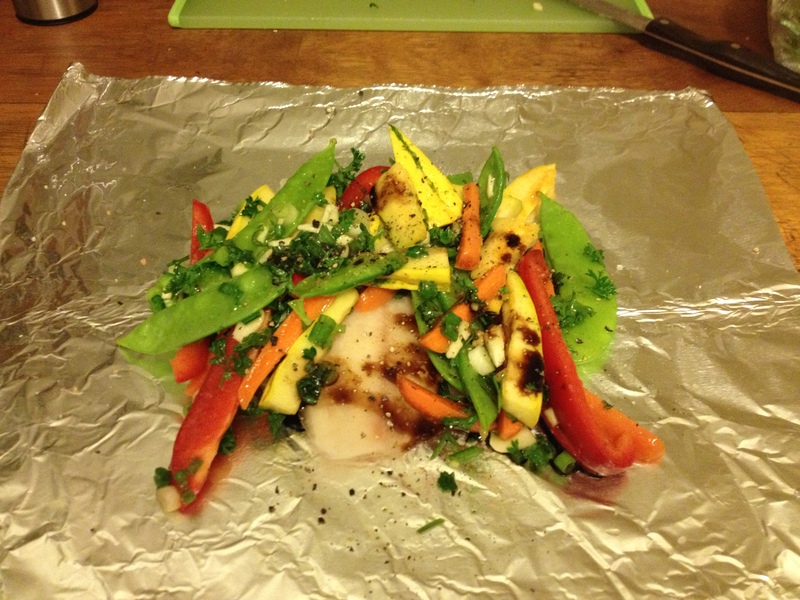 This is what I ate for dinner every single night this past week…and loved it: tilapia and fall vegetables steamed in a perfect little foil package. You guys, this is probably the easiest dinner I’ve made this year and SO healthy! With the food-heavy holidays right on the horizon, give this recipe a try! The recipe can be adapted to whatever vegetables you like or are in season at the moment. And this is why it’s so easy: On Sunday, chop up the vegetables you are going to use for the week. 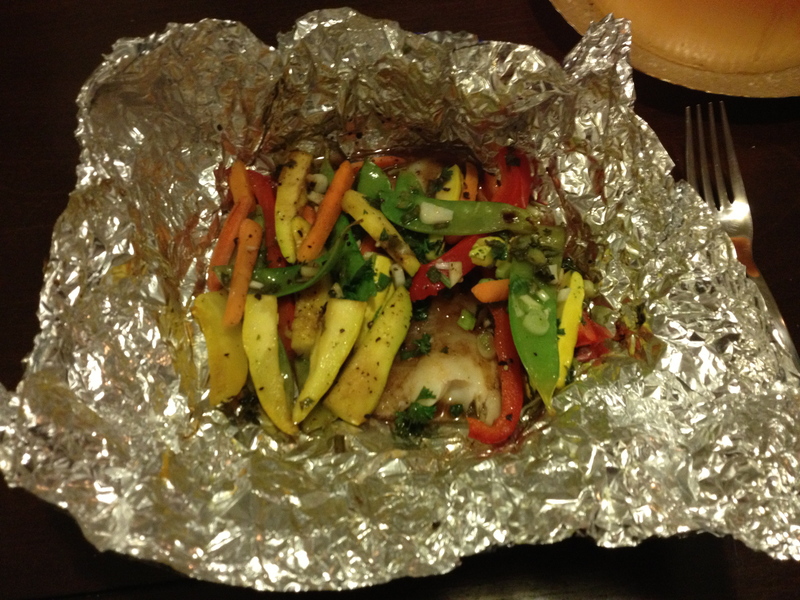 Then, each night create a foil packet of fish and vegetables, drizzle with a few seasonings, wrap it up and bake! A fresh meal each night! I tried a little bit of a different combination with each dinner. I mainly used red pepper, squash, carrots, snap peas, and green onions. I happened to have fresh parsley on hand, so I chopped some of that up too. The second night, I added capers and sun dried tomatoes, which was delicious! I also threw in some broccoli and onion. When you pull it out of the oven, you can put it right on a plate and eat straight from the foil. I used Jenna’s recipe over at Eat Live Run as a guideline but improvised with my own ingredients. So feel free to check out her version, as well as mine, and add whatever veggies you want! Other optional additions: capers, sun dried tomatoes, cherry tomatoes, zucchini, yellow onion, use your imagination…or whatever is in your fridge! In a bowl, combine the sliced vegetables, garlic, and herbs. Drizzle olive oil and lemon juice over the veggies and sprinkle with salt. Toss well. Tear a square of tin foil about 12 x 24″. Fold it in half and place one fish fillet in the center. 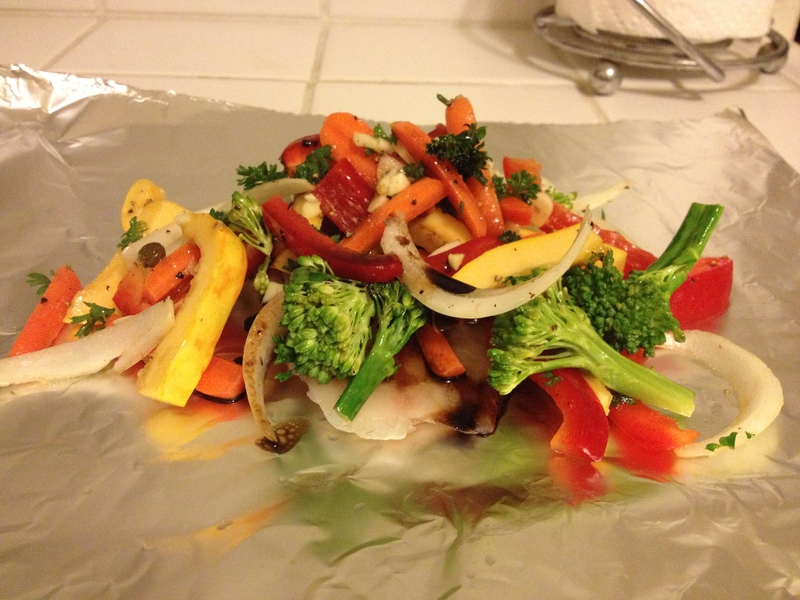 Add your vegetables on top of the fish, then drizzle with balsamic vinegar and add your desired amount salt and pepper. Wrap up the foil around the fish and fold in all sides tightly so that no steam escapes and you have a nice little package. Place in the oven for 15-20 minutes, until the fish has baked through and flakes easily. (I used frozen filets and found it took closer to 30 minutes.) You can always check the fish by unwrapping the bundle and sticking a fork into the fish. When it’s ready, pull out the foil package, unwrap on your plate, and dig in!